절에서 의식을 행하거나 불단 위에 올려놓고 향을 피우는데 사용하는 공양구이다. 특히 밥 그릇 모양의 몸체 아래 나팔형으로 벌어져 원반형의 받침을 지닌 것을 향완이라 하였다. 통도사 청동 은입사 향완은 높이 33㎝, 입지름 30㎝, 받침대 지름 24.7㎝로서 전면에 굵고 가는 은·금실을 이용하여 연꽃무늬, 덩굴무늬, 봉황, 구름무늬로 가득차게 은입사하였다. 몸통 중앙 네 곳에 원을 두르고 그 주위에 꽃무늬가 있다. 현재 원 안에 범자를 찍은 둥근 주석판을 4개의 못으로 고정시켰는데, 이것은 나중에 보수한 것이다. 원 사이 공간은 덩굴무늬가 새겨 있으며, 몸통 아래에는 연꽃무늬가 돌아가며 새겨져 있다. 특히 몸통의 덩굴무늬 사이를 은판으로 채운 것은 이 향로의 두드러진 특징이다. 받침대는 3단으로 되어 있으며 윗쪽은 연꽃무늬, 아래쪽은 덩굴무늬, 중앙은 넓은 공간에 구름문과 봉황이 굵고 가는 선으로 배치되어 있다. 입 주위의 넓은 테인 전의 일부가 약간 휘어진 것이 흠이지만, 외형상 그 형태가 안정감있다. 전면에 새긴 무늬가 매우 복잡하면서도 도식적으로 변모된 점으로 미루어 고려 후기의 제작으로 추정된다. Hyangno (an incense burner) is a general term for objects used for burning incense in a temple, intended to clean the grime of the mind. There are other names, such as hwawan and hyangwan, but hyangno is the all-inclusive term regardless of the shape and size. Hwawan and hyangwan signify only incense burners that have a bowl-shaped body supported by a trumpet-shaped high strut. 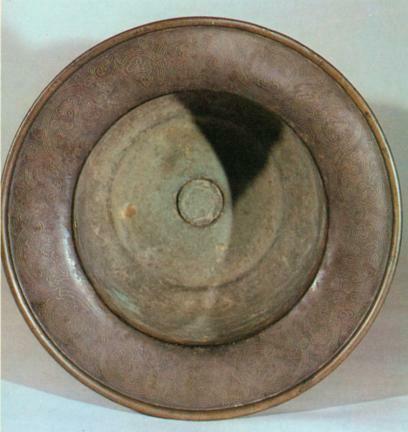 This hyangno is 33 cm in height, 30 cm in mouth diameter, and 24.7 cm in strut diameter. It is engraved all over, using silver and gold threads, with patterns of lotus flower, vine, phoenix and clouds. In the middle of the body are four circles and around these are flower prints. At present, the round tin board stamped with Sanskrit letters is fixed with four nails, having been repaired at a later date. 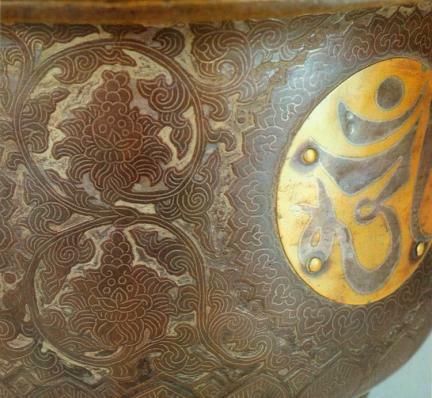 The space between the circles is engraved with a vine pattern, and lotus flower prints are engraved around the lower part of the body in turn. An especially distinctive character of this hyangno is that the interval between each vine is filled with silver plate. The strut has three tiers. The upper one has a lotus flower, the below a vine, and the middle has a cloud and phoenix patterns in the large space with thick and thin threads. The only flaw is a slightly bent rim of the mouth. 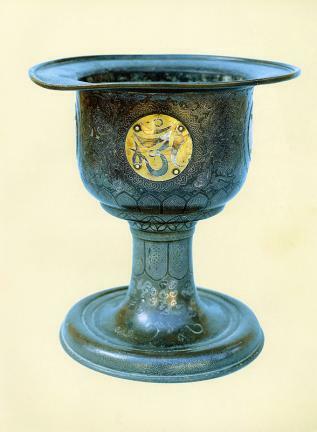 It may be presumed to be a work of the first half of Goryeo because it has a fully mature beauty, and the engraved pattern is refined and elaborate.